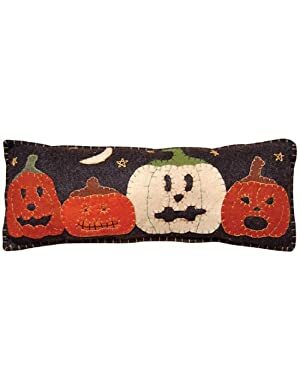 I wanted to share with you three Primitive Style Halloween Pillows that I made a few years ago using scrap fabric, scrap felt and some embroidery floss. I used garage sale pillows for the forms. Hope that these inspire you to make your own! For the Harvest Pumpkin Pillow, I used a primitive stitch using embroidery floss to affix the fabrics and create rustic effects. The fringe along the edge was just a strip of fabric that I cut notches into to create a primitive fringe. I then sewed on the unfinished edge as shown. The Witch Costume Pillow was a really fun one to make! I originally wanted to add a "wart nose" as well, but I had a hard time making it look right. Any suggestions? Finally, the Signs of the Season Pillow was a combination of a few other pillows I wanted to make, but I ran out of garage sale pillow inserts! So, I put them all together and I love it (especially the bat)! I used fabric glue on the felt and added diamond eyes to give the bat a little something extra. I pull these pillows out every Autumn and they always add that homemade touch to my seasonal displays! So CUTE - your pillows look fabulous, and the simple stitchery works perfectly! You've inspired me to try adapt these ideas to garden flags...I think even "I" could pull that off!